Every so often, while blog surfing, I click on a link and immediately feel a sense of kinship. Almost as if a long lost sister's been found. This is how I felt when I started reading "The NieNie Dialogues" over a year ago. Stepha'nie' so beautifully shares little glimpses into her life-- Passion for her 4 small children, good cooking, posh decorating, and fabulous red lipstick worn during romantic dates with her darling husband... She's absolutely INSPIRING in every sense of the word. Unfortunately, sometimes very bad things happen to good people. Dear Stephanie and her new pilot husband were in a plane crash last weekend. I've just been sick about it, and continue to pray for them constantly. It breaks my heart for the pain they've been through, and will continue to go through over the next many, many months as they heal. (You can read about their progress here. Thank you, C. Jane, for keeping us updated!!) As we can all imagine, in a situation like this the hospital bills are sure to be horrendous! There have been donation accounts set up on their behalf and I'd love to help in any way I can. I'd be just tickled if you want to help me in giving! There are new aprons/kits over in the shop. ***LAST update, I swear! (Sorry bloglines and google-reader users! 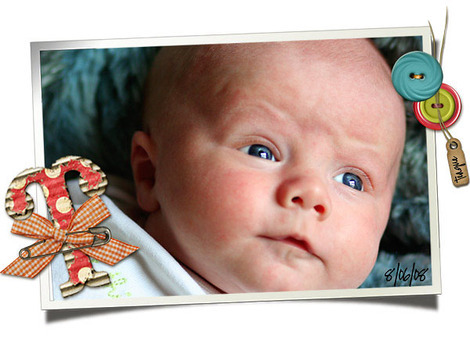 ;) I should've mentioned this before: If you'd like to kindly donate directly to the Nielson family, you can do so by clicking on this cute button. A long overdue post to thank you all for the prayers, emails, and phone calls. After a few short weeks, our little man is absolutely perfect again. He's got a pretty good sized scar on his tummy to remind us all of his adventure. Besides that, he's no worse for the wear. We're so very thankful! I'm getting the itch start creating again. My brain seemed to be on hiatus while babe was cooking, but the ideas are flowing full force. The challenge is trying to decide what direction to head now that time is a bit more limited... thinking about taking the jump into manufacturing (SCARY! 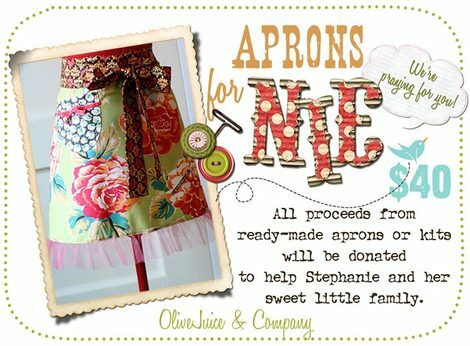 )...wondering if aprons are phasing out (Are they??)... not knowing who to contact, and what questions to ask (Ideas? )...really just trying to focus and use the time that I do have, wisely. I've had an amazing response to the kits and would love to offer some more advanced patterns. I'm just not quite sure how to go about it all yet. Lets go on this journey together, shall we?